1. Preparing the pulling muscles needed for the one-arm chin. 2. Varying the weight by gripping the towel at different lengths is pretty easy. This point is very useful for doing drop sets without the need for weights. 3. There are many different variations of this exercise. 4. It's a real power exercise. When trained hard for low reps and medium to high sets, you will get big, powerful arms and a massive upper back in no time. Of course, this is an article about one-arm chinning, but, hey, do you want to beat me if you need new shirts because your old ones are torn because of your big arms? I don?t think so. 5. It?s a very functional exercise. Most guys say the classic pullup is a functional exercise, but have you ever seen any straight bars in nature? While climbing? Your arms are almost never even, so become strong in this position! 1. Start conservatively. Place your non- working hand 25cm below the bar or higher. 2. Start with low reps, low sets. 3. While progressing, use the "fist length"- technique to get the needed length. 4. Hold the lock while chinning. 5. Try to work as much as possible with you working arm. 7. Add lock outs to strengthen your tendons. Very important point! 8. When you reach advanced towel length, add speed band work to pass the last 10%. 1. As I wrote above, I do not believe in technique, but in pure strength to become a good one-arm chinner. Nevertheless I will tell you one trick, and I think this trick is the only thing I ever used that I would call technique. When you dead-hang with your right arm on the bar, you will always rotate counter-clockwise, never clockwise. To fight the twist, learn to press with your palm, especially the part below your pinkie finger. 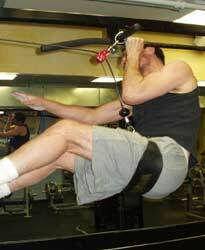 Try to bend the pull-up bar counter-clockwise using your working hand. With this technique, you can stop the twist and control your body rotation. 2. This article is mainly about the road to your first one arm-chin. But what to do when you are almost there? You could use negatives, speed bands, longer towels, other reps, more sets and so on, but I would do the following: Suppose that you could easily break the deadhang, but can't go beyond 90?. Start in the deadhang and pullup as high as you can while using good form. When you meet your sticking point, grab the forearm of the working arm with your free hand and pull your chin above the bar. When you are at the top position, remove your "free" hand and do a slow "true" negative rep. This trick will work for every sticking point. Suppose your sticking point is the first half of the one-arm chin. Start in the deadhang while your free hand is resting on your working shoulder. Pullup while pressing with your free hand on the shoulder to assist the whole movement. When you reach the 90? mark remove the assisting hand from the shoulder and pullup in true one-arm chin style. Do a slow negative and repeat the whole movement as often as you can. With this technique you could easily do reps. When you could do sets of 3 for at least 5 sets, you are very advanced and on the way to become a great one-arm chinner. Keep up the volume and try to get more and more sets into your workout. 3. Forearm work: I highly recommend one arm dead-hangs. Heavy dead-hangs will strengthen your arm from the fingertips to shoulder. Work up to heavy weights (~15kg and more) as soon as possible for sets of 30 seconds. When you practise them without weights, try to get partial one arm chins ( ROM ~ 5cm). Do them in a springy fashion. You could get 15 reps or more during a 30 seconds interval. Practice them for a month and you will never lose a rep when you are doing reps of one-arm chins because of a weak grip! 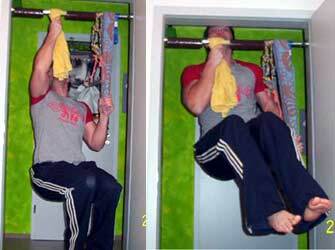 Alternate them with one arm dead-hangs using a towel. 4. Stop doing isolated arm work while training for a one-arm chin. Curls are useless! Believe me, you will get stronger than ever before by doing nothing but heavy one arm chinning work! 5. Perhaps the most useful tip: Love the damn plateau! Fall in love with periods of sticking points. Love them. Jack met the plateau, I met the plateau, and so will you. 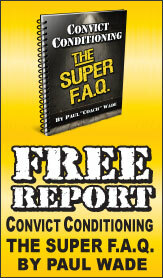 Perhaps it took a month to get only 1 rep more in a 3 set workout. Who cares? Don't try to reach personal bests every month. Keep it easy and simple. Make a 6 month plan, for example, using the pinkie finger, adding "two fist" length, adding 2,5kg. This is enough! Do not rush things.